of 4th and 5th graders from the School District of Lancaster. Our workshop began with an introduction and presentation of our socially-engaged project, ArtBike. and introduced the benefits of using art to tackle social issues. 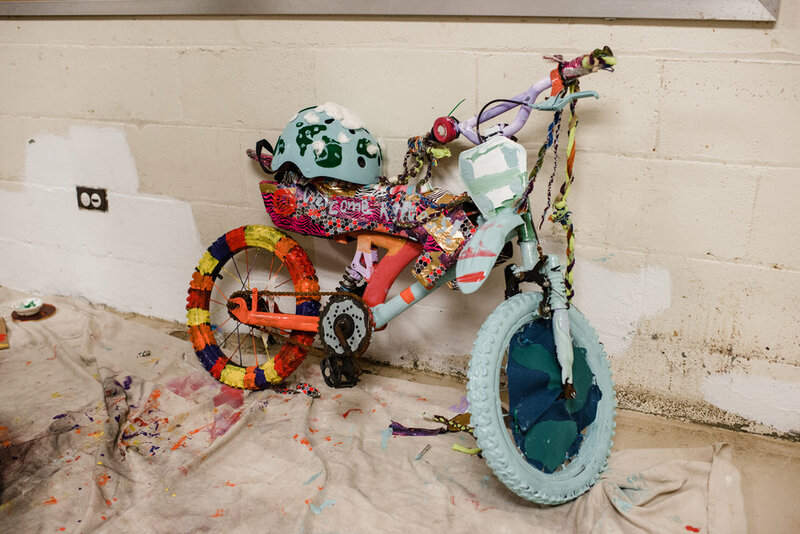 Students were split into two groups and led through creative brainstorming exercise— each was tasked with creating a bike concept that not only represented the school district, but also addressed issues the group felt the district needed to focus on. These bikes would be seen by students, teachers, parents and administrators— how could we use the bikes to inspire pride in the district alongside inspiring change. Each group came up with so many great ideas! (and some pretty funny ones). One group settled on creating the “THINKING BIKE”, the other a “WELCOME REFUGEES” Bike. From there, the students worked collaboratively in small groups to turn their ideas into a reality. The final products have been on a rolling display throughout the district’s elementary schools.